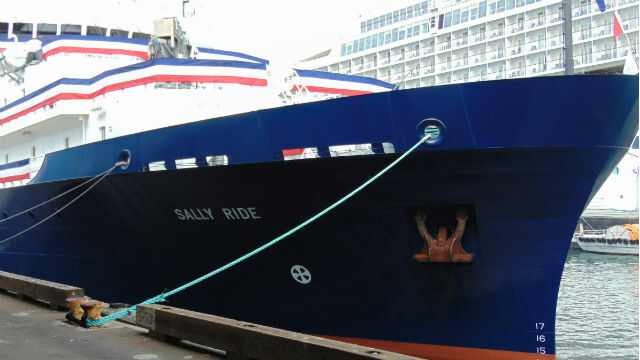 The legacy of astronaut Sally Ride was celebrated Friday as a new research vessel named in her honor was commissioned on the downtown waterfront. The 238-foot-long R/V Sally Ride, owned by the Navy and operated by the Scripps Institution of Oceanography, will embark on its first mission next month, when it conducts a study of the California Current. 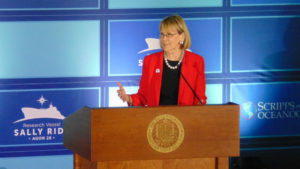 Margaret Leinen, vice chancellor for marine sciences at UC San Diego, said the mission of the ship is to “understand and protect the planet” while also supporting Naval research. Rep. Susan Davis, one of the political leaders speaking at the ceremony, said the ship will be in inspiration to women in science like its namesake. “Sally Ride was a role model to all of us,” she said. The vessel was built in Anacortes, WA, and delivered to Scripps last month. It is the institution’s first new vessel since the Roger Revelle more than 20 years ago. The public is invited to free public tours of the new ship on Sunday from noon to 4 p.m. on Broadway Pier. Identification and flat, closed-toe, closed-heel shoes are required.